During winters, Mooli bhaji or radish leaves are available in plenty. Its high vitamin C content boosts our immune system. It helps in preventing common infections like cold and cough. Radish leaves are rich source of Vitamin A, Iron, phosphorous and Thiamine. The leaves can be stir fried or cooked along with dal. 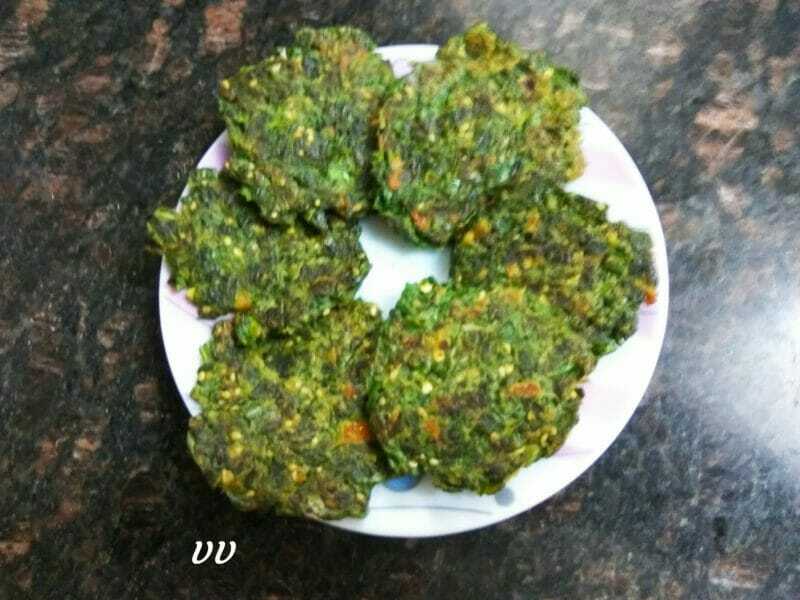 I used these leaves along with multi millet flour to make pakodas/ bajjis. Mix all the ingredients well to form a dough. Divide into lemon size balls and flatten them. Heat a nonstick pan, grease and shallow fry the patties with oil on medium heat. Once the bottom becomes crisp, flip and cook the other side with oil. 1. Wash the leaves and pat dry before cutting. 2. If the mixture is too sticky, add more millet flour/gram flour and adjust the consistency. 3. Any single millet flour can also be used. 4. For deep frying, add more flours or reduce the quantity of leaves and adjust spices accordingly.